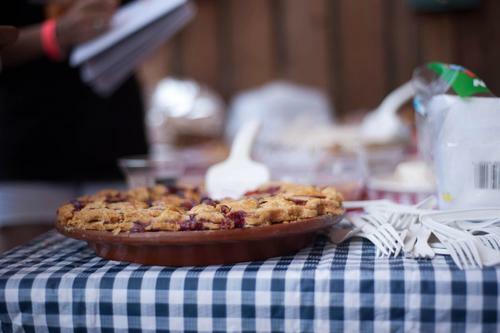 Nothing beats a slice of homemade pie after an afternoon full of BBQ and beer, and that’s exactly what some of our Summer Beer Tasting guests got this past weekend. To what did we owe this confectionary delight? The pie contest, of course! Fifteen pies were entered in the competition, and our judges tasted them all, poring over appearance, filling, and crust. 1st Place: Vickie Watson, for her boysenberry blueberry pie. 2nd Place: Marie Brennan, with a peach blackberry pie. 3rd Place: Matt Kent, for his coconut cream pie. Because there were just too many delicious pies, the judges also awarded three honorable mentions: Jen Mischak for her banana cream pie with caramel and chocolate, Stephany Wilkes for a peach custard pie, and Matt Kent for his second entry, a s’mores pie. Each winner was awarded a beautiful ribbon by our emcee. 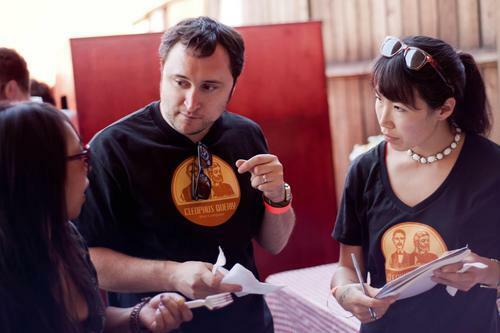 After the award ceremony, the pies were devoured by hungry beer lovers. Looks like everyone was a winner here, folks. Thanks to all our pie competitors! To see more photos, visit our Summer 2012 Beer Tasting album on Facebook.